Being able to speak is something that most people take for granted. However, some of us are born with Cerebral Palsy, have ALS/MND or may have acquired a disability through an injury or a stroke—all of which can impair our ability to speak. Tobii has released a range of new augmentative and alternative communication (AAC) solutions that help individuals with speech impairments communicate.Purpose built communication devices that enable communication – in all forms, anywhere, anytime. Tobii devices are portable eye-controlled communication devices. 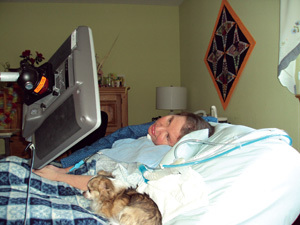 Everything, including a screen, eye control device and computer, is integrated into one unit. Just connect to a power source, such as a wall socket, power wheelchair or separate battery. The device can be mounted for use at a desk, wheelchair, bed or anywhere suitable for the user. With powerful, state-of-the-art features, MyTobii brings eye control to a whole new audience of users. The interface can be configured for many different skill levels thus being flexible enough to serve many different user groups. The eye tracker doesn't need the user to "do" or "wear" anything. Simply sit in front of it, follow a dot during a 30-second calibration and you are on your way! With flexible mounting, easy customization and different hardware options, every situation is catered to. Tobii can be relied upon to keep working. Tobii will operate precisely regardless of glasses, contacts, eye color or light conditions. With Tobii, those with uncontrolled head movements can use eye control for the first time. Tobii's unique ability to deal with large head movements opens up eye control to user groups who have been unable to use other systems. Tobii Technology's world-leading eye tracking techniques and an integrated, tough design make the MyTobii eye tracking system extremely accurate, portable and tough enough to deal with real-life. No fragile external cameras or lighting units mean your system will be able to go everywhere with you. High accuracy and powerful interaction techniques mean MyTobii will also keep up with you. 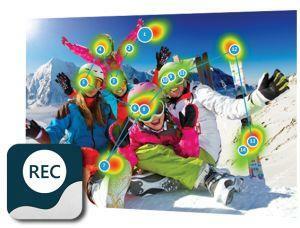 Eye control enables users with special needs to communicate and interact using only their eyes. This brings new opportunities for communication, interaction and improved quality of life for users who previously relied on slow and cumbersome alternatives for their communication, such as manual scanning systems or head-mounted pointing devices. With the Tobii product suite, eye control is reliable, easy to use and accurate. -Using only eye movement, users can easily and quickly communicate where other techniques are not effective. -With Tobii, eye control works even when the user has involuntary movement as a result of CP or other disability, those who wear glasses or many other characteristics that limit the effectiveness of older eye control systems. -Typical user groups that benefit from eye control include users with Cerebral Palsy, ALS, MS, spinal injuries, and many others. -MyTobii works with all users, regardless of glasses, contacts and or eye color. -Functions precisely in almost every situation - at home, at work or at school. The flexible mounting system makes it possible to mount the unit at a desk, on a wheelchair, over a bed - anywhere suitable for the user. 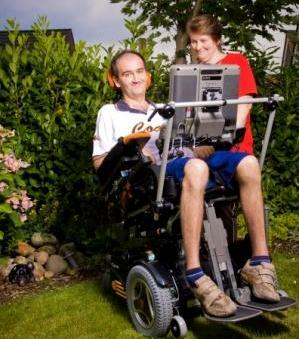 -Tobii is designed from the ground up with one goal in mind: making communication easy for the toughest users. -After a fast, one-time calibration, no additional adjustments are needed. Just get in position (in front of the unit, as in front of a regular computer screen) and it starts automatically. -Tobii puts people back in the driver's seat with custom designed applications for email, document editing and web browsing tools. There are even eye-controlled games! t, as in front of a regular computer screen) and it starts automatically. -A wide range of partner software has been Tobii enabled, which gives the user effective eye control with leading communication solutions. -The patented Tobii Direct Control input allows users to just gaze and click, without using a mouse pointer. This makes eye control as an interaction technique much faster and easier to use.